If you thought the recent buzz about America and Japan pitting giant, human-piloted robots against each other was just a publicity stunt, we've got news: it's definitely, 100% happening. This is not a drill. A real-life mech showdown will take place in mid-2016 at a yet-to-be-decided location, but MegaBots needs the help of the public to get there - assuming you're on their side and not rooting for Japan's Kuratas bot. It's strange that the first Kickstarter to get MegaBots' robots off the ground failed to meet its goal. That didn't matter in the end - corporate sponsors stepped in - but MegaBots has just launched a second campaign with the purpose of making its mech warrior battle-ready. $500,00 is the goal. 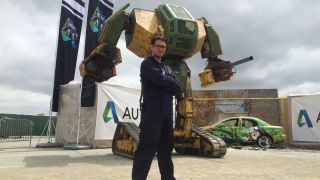 "That's for speed, it's for armour, it's for weapons," MegaBots co-founder Brinkely Warren told TechRadar. It's also a response to some threatening trash talk from the enemy. When Japan accepted MegaBots' challenge to a duel, it was on one condition: there would be some melee combat. "I want to punch them to scrap and knock them out to do it," were the words that came from Kogoro Kurata, the father of Japan's entrant. "Our robot is not really prepared for melee combat," said Warren. "It's too slow, the armour's not good enough, and the weapons are projectiles - they shoot giant paintballs. So the melee combat weapons are going to be things like a giant chainsaw, which we're going to put on the robot. There might even be some flamethrowers." MegaBots' current "Mark II" warrior is crude, standing at 15 feet tall and maneuvering on tank-like tracks - but the planned improvements will make for a much more impressive contender come battle day. "It's going to be a major upgrade," said Warren. "It's going to be the world's most advanced human piloted robot. We've got a bunch of partners lined up, and if America chips in and people donate their cash, then we're going to build an amazingly badass machine that's gonna be way better than the one we've got today." Both teams have agreed to share the exact size and weight of their robots before the fight, but it's yet to be decided if both parties will have to reveal all of their weapons. "I know for us we are going to reveal some of our weapons because we're asking America to support it with our Kickstarter campaign," said Brinkley. "We're saying, 'We're going to put a giant chainsaw on our robot, and we need your help to make it a reality'." Flamethrowers and chainsaws sound a lot more dangerous when you realise there will be an actual person inside each robot, but Warren assures us there will be a tap-out button that will shut down both machines if anyone's life is threatened. "We want to highlight not only the projectile weapons, like the paintballs, but also the melee combat," said Warren. Should each round be a free-for-all, or should each round be dedicated to a different type of combat? These are the details being worked over. Then comes the question of where. The battle will take place on neutral ground, Warren confirmed to us, but an exact location is yet to be decided on. Singapore, Australia, Malaysia and Dubai have all been thrown up as possible battlegrounds, while Warren told us there's even some discussion about clashing robots on an aircraft carrier in the middle of the Pacific ocean. But the most important thing is to get as many eyes on the fight as possible. That's because the end goal isn't next year's fight, but to inaugurate an entirely new spectator sport - a World Cup for a generation of MechWarriors fans, held in stadiums around the planet. People will watch live, place bets, squabble over tactics, and cheer on their favourite hulking robot to win. In fact, we were the first to inform MegaBots that some agencies are already taking bets for next year's showdown. As for next year's battle, it's difficult to tell who has the upper hand right now; MegaBots' Mark 2 has brute force but Kuratas has dexterity. "Ours will be more of a bone crusher," said Warren. "While we don't know what upgrades the Japanese team will make to the Kuratas robot. From watching videos of their robot it seems like it's currently faster and has better cockpit design." Company names will brand these robots; like Nascar and Formula 1, there'll be a huge incentive for companies to invest in R&D and write it off as a marketing expense. But more importantly, all of this could breed a new generation of engineers. "We're basically these crazy Americans in our garage making monster robots out of video games and trying to create this new sport that's going to be an amazing spectacle," said Warren. "But the beauty of the spectacle is that it could inspire kids to want to grow up and be an engineer. Instead of wanting to play soccer, maybe they'll think engineering is cool. We're basically building the major leagues of nerd sports."